Acting Consul General Dejan Radulovic visited the church and school municipality of "Holy Trinity" in St. Louis and on that occasion had a meeting with members of the Serbian community. 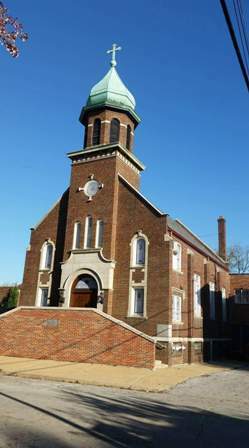 He attended the morning liturgy at the "Holy Trinity" church followed by the celebration of the Slava of the Serbian Sisters Circle. On this occasion Mr. Radulovic addressed the audience, congratulated them on their Slava and informed them about the activities and responsibilities of the Consulate General. At the same time, he thanked the parish on their efforts and activities that help to preserve the identity, language, culture and tradition of the Serbian community in St. Louis. In conversation with the Acting Consul General members of the Serbian community were interested in obtaining documents from Serbia, the issue of passports, registrations of birth of a child or a marriage, issues of citizenship and other consular issues. Father Ljubomir Krstic, the parish priest, expressed his gratitude for the visit and stressed the importance of cooperation with the Consulate General. Also, he stressed that this was the first visit of the representative of the Consulate General to their parish in St. Louis.